This story begins the night a fellow student read my mind. It was spring of 2006 and I had just begun my Graphic Design journey at Montgomery College (“MC”). 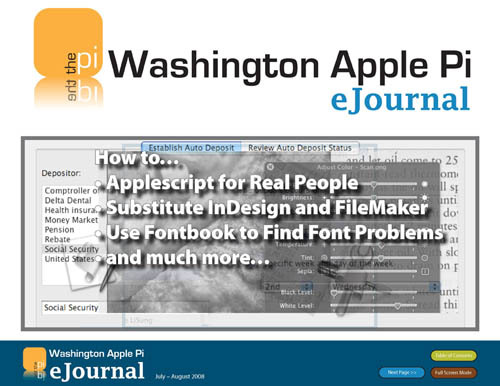 John Barnes, at that time President of Washington Apple Pi, was one of the students in the evening InDesign classes. One of our assignments was to bring two sample publications that were, in the student’s opinion, representative of good and bad design. When John presented he proudly displayed the latest issue of Washington Apple Pi Journal as his example of a nicely designed publication. It had a green cover with snowflakes and it claimed to be a journal for Macintosh Computer enthusiasts. In addition, the cover’s logo had a large depiction of famous Washington monuments and its masthead contained a strange looking triangle. None of this said anything about its content. When John finally flipped to the interior pages, I must have outwardly cringed as I thought, “I don’t know much yet about designing a publication but even I could do better!” John looked at me and I sensed that he had read my mind. If looks could kill, I wouldn’t be here to tell this story. As it turns out, life has a funny way of turning the tables. Moving forward to the spring of 2007, it is the last day of my Advanced Photoshop class. Again, John is one of the students in my class. I was saying my goodbyes to Ed Riggs, our professor, when John overheard me asking Ed to think of me if any internship should become available. John jumped out of his chair and exclaimed “I have an internship for you! 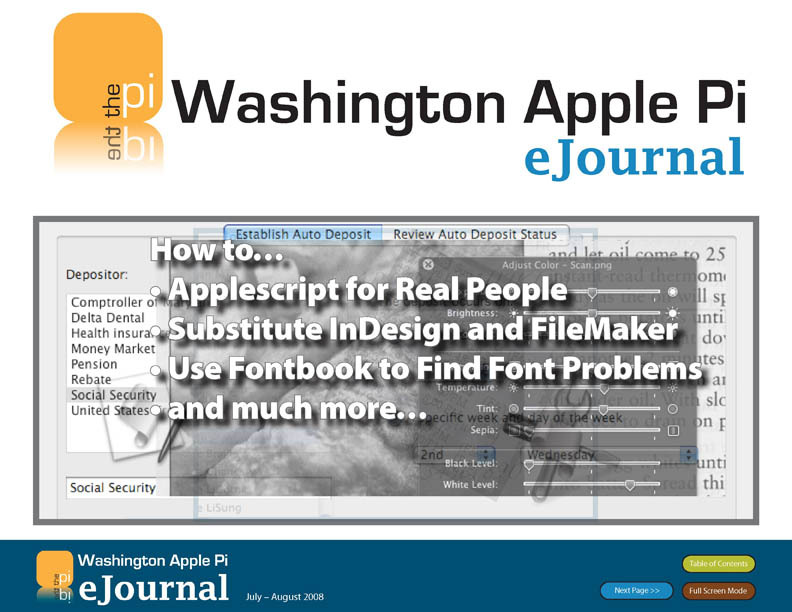 Would you consider doing the layout of the Washington Apple Pi Journal?” At that very moment I flashed back to the day when John presented his sample of a good design. My day had arrived. The tables had turned. John was challenging me to do better. A meeting with the new Pi President, Bob Jarecke, was quickly arranged. 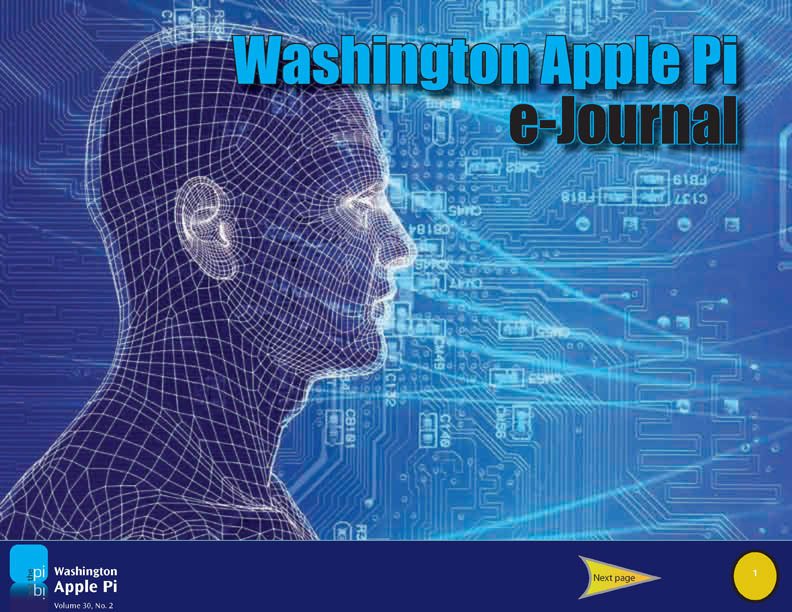 I was to accomplish the redesign of the Washington Apple Pi Journal starting with the July-August 2007 issue. You may remember that issue. It was the only issue in the 30-year history of the Journal that contained a full-color picture centerfold. We were announcing the winners of the first Washington Apple Pi Photo Contest. All I can I say is that there were quite a few moments during its production when I thought “Oh boy! I’ve bitten off more than I can chew!” In the end, sheer determination and hard work paid off. The issue was a success and I received a standing ovation at the following General Meeting. Subsequently, after receiving a tiny slap in the wrist from the Managing Editor about having white spaces in the wrong places, I was bestowed the title of “Design and Production Editor” for the Journal. The ink on my first issue was barely dry when, armed with my success, I ventured into deep waters. “Why isn’t the Journal published electronically?” I asked in an email exchange to a few key Pi players. We could save money. We could help the environment. We could produce it in color. Members could click through to the resources. It could be searchable. There would be no delays at the printer. The advantages were numerous! The intensity of the responses I received took me by surprise. They ranged from “Is it done yet? What are you waiting for?” to “Over my dead body!” Not wanting any dead bodies on my conscience, I quickly shelved the idea in the recesses of my Mac. Six months or so later, the phone rang. It was Bob. “Would you come to the office? We need to talk.” I don’t get summoned to the “office” very often. This had the potential of being a serious matter. It was important. There was electricity in the air. When I arrived, Bob didn’t waste any time. “So, how about that electronic Journal? Do you think you could produce a prototype for me?” I could not contain my excitement. I couldn’t wait to get back home and get started. As I was leaving the “office” Bob held me back with a question: “What shall we call this electronic journal?” I hadn’t thought of that, but quickly blurted out “How about the eJournal?” The name was an instant hit. Back home sitting behind my Mac I got to work. Oops! The task was a lot more complicated than I had anticipated. I struggled and thought, “I need to learn how to keep my mouth shut!” What had I gotten myself in to? Simply converting the printed version of the Journal to a PDF did not make an electronic journal. The layout, design and typography were optimized for print. The printed version of the Journal was difficult to read on screen, it was cumbersome and too long. Taking cues from my favorite electronic magazines and lessons learned at MC, I came to the conclusion that I had to approach it from a different angle. My first prototype looked like something straight out of Star Trek. It was clumsy, the navigation buttons didn’t quite work, the design barely held together but it was a start. It was at least readable onscreen (see figure 1). My second try was a big improvement over my first and this one landed in Bob’s inbox (see figure 2). I got kudos from Bob and a “Press on! Will you produce another one with the material from the next issue?” Armed with fresh material from the July-August 2008 issue of the Journal, I produced the third prototype. Bob was flying high and took it to the Board. The Board was pleased, they approved publication of the eJournal and now I was in business (see figure 3). Very, very nice! Great rendering of graphics and pictures. I'll have to change my Journal reading habits but that's no big thing. Hopefully publishing it as a .PDF document will not only save on expenses for the WAP but will ultimately become a convenient research tool for our members. I thoroughly enjoyed reading the eJournal. It was attractive visually and a good size for these "older" eyes! It makes infinite sense to do this via the Internet… less cost, less waste, more trees spared… all sorts of good things. Bravo!! This edition looks great, especially in the Full-Screen mode! This is real progress, indeed. The eJournal I just reviewed is absolutely fantastic! It is by far as professional and well planned as any magazine or journal published by organizations with 10 times the personnel. I'd say that if this were placed on YouTube or some other such site the membership would grow rapidly from the exposure. There's only one thing that you failed to point out in the email that was sent introducing the eJournal, and that is the huge benefit of it being in full color! It just makes everything pop. Congratulations! The eJournal is one of the finest electronic presentations of former print material that I have seen. I have the luxury of a 24 in. monitor and in full screen, the pages of the eJournal jump out at you (probably because of the bright white background and the vivid colors). I hope I can keep reading them now as they arrive. Again, thanks for your hard work and dedication in the numerous activities of the Pi. I tell people, out here, quite frequently to check out the Pi as it is the best user group there ever was or is. 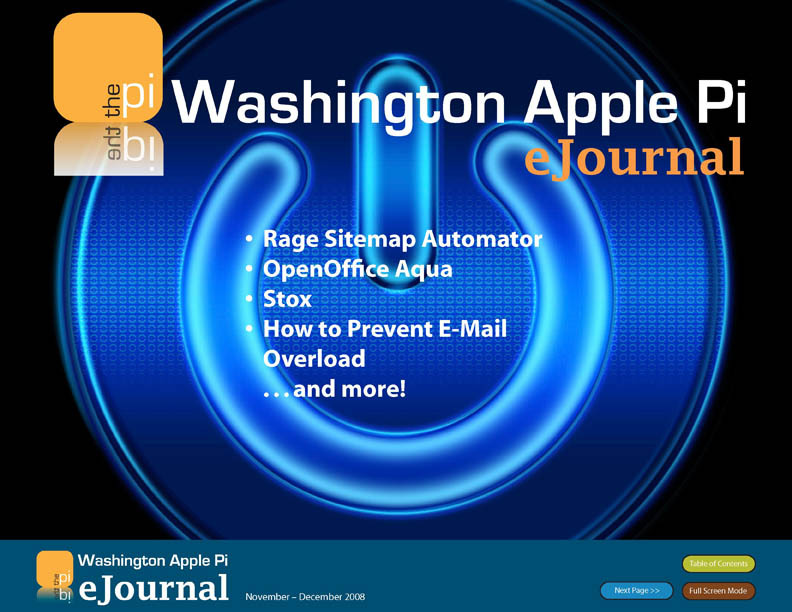 Over the past year, the Washington Apple Pi Journal’s print run was 1000 copies per issue. Each issue averaged 48 pages. That is 48,000 pages, or 96 reams of paper per issue, or 576 reams of paper per year. That’s a lot of paper!